The data you need to manage isn’t getting smaller, or slower. It’s a snowball, compounding in both speed and volume. If you’re building applications on fast, streaming data, you need to analyze it, gain insight and take action on it now, not at the end of a batch job. 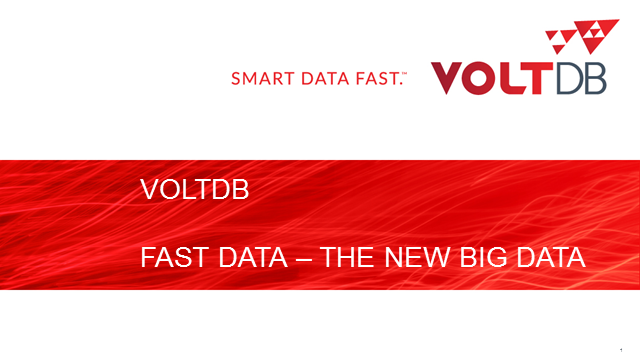 Fast data is streaming data or data in motion – and it creates Big Data. Forrester analyst Mike Gualtieri thinks the perishable insights in fast data can have exponentially more value than after-the-fact traditional historical analytics. So how to tap it and why would you use the same infrastructure to handle fast data the way you handle big data? Many approaches used to manage fast data have challenges: Batch processing – if your data is handled in batches, even micro batches, actions taken on that data can be too late Eventual consistency – sacrificing data consistency can lead to errors and problems such as under/over billing, or under/over budget or resource use Integrating a collection of moving parts – trying to build a solution with individual components can take more code, more time, and more expertise than you bargained for, and results in a more complex, less reliable (and hard to manage) solution What does work? An in-memory database that supports actions and streaming analytics in real-time without sacrificing transactional integrity, performance, and scale. Tune in to our webinar to hear more and see the lessons learned from an actual fast data use case.